CNN’s Anderson Cooper joined the numerous journalists from all over the world to cover the aftermath of Typhoon Haiyan’s devastating spin through the Visayas group of islands in the Philippines last November 8. We cried for our countrymen who died, and for those who survived but lost family members and everything they owned. This tribute from Anderson Cooper touched the hearts of many Filipinos. Maraming salamat din (thank you too), Mr. Cooper, for recognizing the strength, faith and courage of our suffering countrymen. Foreign broadcasters have repeatedly referred to the Philippines as a poor country. Yet we, the Filipinos, have always been proud of our rich heritage, of the indomitable Filipino spirit. It is our true wealth, something that no one or no catastrophe can take away from us. We can never repay the generosity of people and governments from all over the world. We hope that the manifestations of courage and strength – the Filipino spirit – will in some way help pay back the gestures of compassion shown to us. If only for a few precious days, weeks – maybe months – the world unites, again. The world has become borderless. The deaths of hundreds of thousand of people in Thailand, Haiti, Fukushima and the Philippines have shown us that all nations can unite, work together and help each other. I pray that their deaths will not be in vain; that sooner and not later, the nations of this world will realize that we can all live peacefully and harmoniously together. When everything else is taken away, broken, battered, soaked, raw, stripped bare, you see things. You see people as they really are. This week in Tacloban, Samar and Cebu, amidst the hunger and thirst, the chaos and confusion, we’ve seen the best in the Filipino people. Their strength, their courage. I can’t get it out of my mind. Imagine the strength it takes for a mother to search alone for her missing kids, the strength to sleep on the street near the body of your child. We’ve seen people with every reason to despair, every right to be angry instead find ways to laugh, to love, to stand up, to move forward. 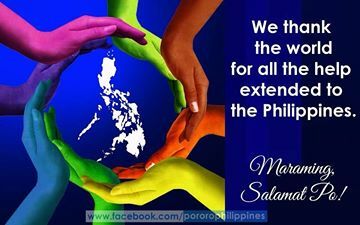 Mabuhay (long live) Philippines! Maraming salamat (thank you) for all you’ve shown us. Maraming salamat (thank you) for showing us all how to live. 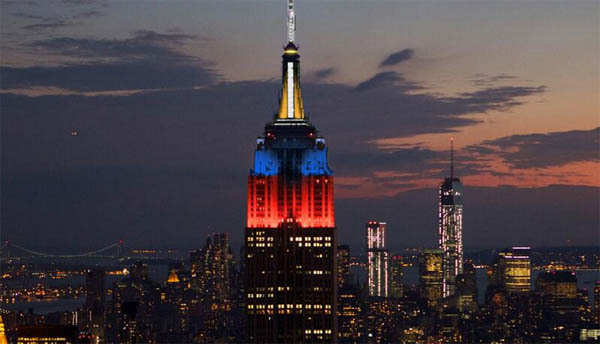 “Tonight & tomorrow night, our lights shine in the color of the ‪Philippines flag to raise awareness of the ‪‎Haiyan tragedy,” Empire State Building official account handler stated.